This card was originally sent to us by Cyndi Fox many years ago. 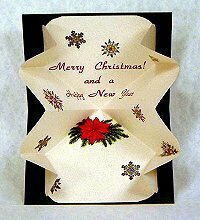 It is a wonderful card that is simple to make and will amaze anyone who receives it. It is a great project for children and adults. Paper- 1 sheet of thin paper 8 1/4" x 8 1/4" (cardstock is too heavy for this project). Card- One folded card that is size 4 1/4" x 5 1/2" (folded). This size is also called A2. 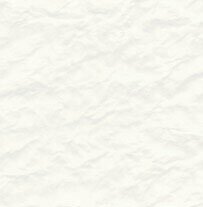 Envelope- One envelope size 4 3/8" x 5 3/4". This size is also called A2. Glue- A UHU glue stick is best however rubber cement can also be used. Art Supplies- If you want to decorate your card and envelope then you may want to get out the rubber stamps, embossing powder, colored pencils, pen, etc. Fold the paper on the diagonal from corner to corner, then crease. It should look like figure #1. When you open up the paper it should look like figure #2. Take the paper and fold it in the opposite direction corner to corner, then crease. Next, open it up and up and it should look like figure #3. Lay the paper on the table with the creased side up so that it looks like a pyramid. It should look like figure #4. The next fold is a little tricky. Pinch the pyramid, fold and flatten into what will appear to be a double triangle. It should look like figure #5. There will be four pointed corners. Fold each of the corners to the middle of the open side and make a crease (the fold should occur at dotted line to the black dot in the middle. It should look like figure #6 (only one corner is shown in its folded position in this picture). Unfold each corner and reverse it and tuck it into the inside. In figure #7 one corner is shown tucked inside. When all of them are tucked inside it should look like figure #8 from the bottom, and like figure #9 from the top. Decorate the insert now before you glue it into the card. Be sure to plan which way the card will open. You can also decorate the envelope and the outside of the card now. Don't bother to decorate the inside of the card as the insert will hide it. Glue it into the card by gluing around all the edges on one side of the insert. Then put the insert into the card (it should look like figure #10) and press it shut. Then apply glue to the other side of the insert and press it shut. Do not open the card until you feel the glue is dry. When you do open the card it should look like figure #11. The insert can be trimmed to create interesting edges before it is glued into the card. With the insert folded and closed you can cut the corners off or cut it down the sides to create a "snowflake" pattern. For those of you who made snowflakes in kindergarten you will know how this works. For those of you who did not you might want to make a few extra inserts and experiment. If you want to run your insert through a laser or ink jet printer you can do so before it is folded. We like to use thin mulberry sheets to make the inserts out of. They fold well and are quite elegant!